• Expert block: ideal line, braking and steering technology, chassis geometry, tires, etc. SportVers.de offers a one day casualty insurance valid on race track. Costs per day: 15,- Euros; Insurance sum: 100.000,- Euros. By clicking, we forward your registration to the insurance company. For example for renting a box, questions about tires for race track use, etc. After booking all information regarding payment will be sent by email within 3 days. By sending the booking form I confirm and agree with the General terms and conditions of the company Michael Fiala Motor-Sports. Motorcyclists are highly interested in their safety. The MOTO-ACADEMY® is supporting this target by enabling its customers to get their own vehicle known in detail behaviour at all speed. No better place than race track can be found for training area. We have to face that motorcycling usually takes place beyond 50 km / h. Thus we need a safe area without barriers, oncoming traffic, but perfect road surface. Race tracks can offer all this plus technical and medical support. 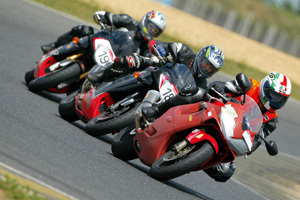 Most of all for safety reasons only a race track can be considered for motorcycle trainings. The Pannonia Ring is very suitable due to its route guidance and easily accessible from the east of Austria. The MOTO-ACADEMYR has made a very good name in the field of driver's trainings beyond 50km/h. The competence is based on the didactic knowledge of teaching and the experience gained in racing. The training starts at 9.30 am, before that the participants are accredited and the vehicles prepared for the use on race track, in particular the tire pressure has to be adapted to the higher loads. The training is proceeded in up to 8 classes, the participants are divided into the individual classes according to their riding skills. The fastest riders will train separately in order not to put stress on the other participants. Safety always comes first. The first ride on the circuit has to be considered as a track inspection. Many participants never have been on race track before, so they need time to get adapted. drive for the first time to get used to the enormous road width. After this we continue with the expert's block which takes place in box. Well prepared to the upcoming the individual training of the classes starts. At lunch break demonstration rides performed by the instructors take place. After the lunch break, the individual training is continued and concluded with the video analysis. How to get there: The race track is located in Hungary about 120km far away from Vienna. The GPS coordinates are: 47°18'14.68"N - 17°03'01.75"E.
Safety: In particular the advantages of a race track are, that technical service and rescue are ready to go at any time. During the training, there will be 2 ambulances on duty, cooperating with the medical center on the spot. Technical circuit data: 4.740 m length in total, 11 turns to the right, 7 to the left, track width 11m - 13m, spacious run-out zones. The TrackRiders photographers ensure that your day on race track will become an ever lasting memory. MOTO-ACADEMY® will take place on the 17th of June 2019. We look forward to seeing you at one of this event, please use the form above for your booking.